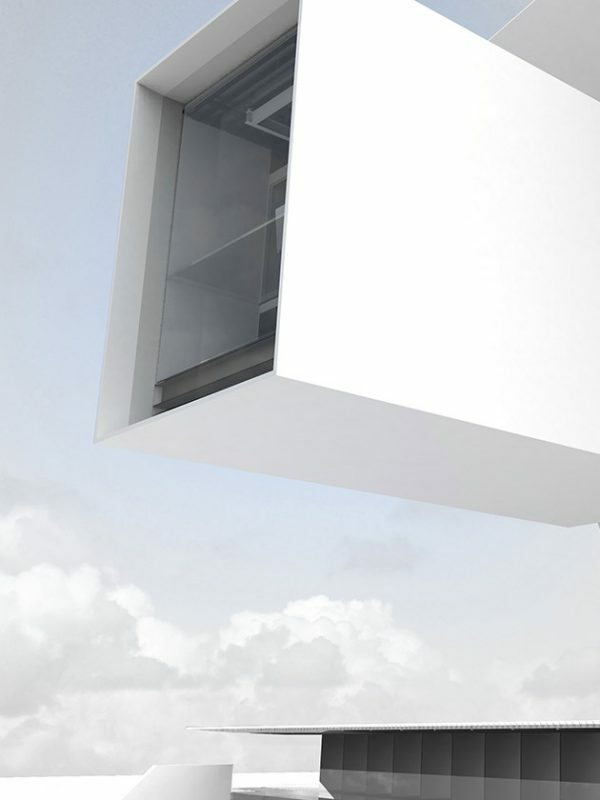 A zero-energy home like no other: The living space in Mo Ventus is formed entirely of glass. Rather than turning up the air conditioning on hot days, a shell extends right around this futuristic building to keep residents cool inside. It’s still a prototype for now. But it’s set to form a new precedent – for homes worldwide. Movement, in this case, relates to sections of the building’s “shell”, which can be extended and retracted. This is necessary due to the fact that the living space is fully glazed, from the floor to the walls to the ceiling. The interior fully embraces nature as a result, as well as minimising energy consumption, as the transparent façade reduces the need for electric lighting by illuminating the interior with natural daylight. Another challenge was to avoid the need to turn the air conditioning up to full on hot days, in order to keep the glazed space cool. The solution is a grillelike sunscreen and a closed outer sheath that are mounted on sliders, and which are capable of concealing or revealing the glass space underneath as and when shade and insulation are required. “The technology enables flexibility to control the amount of heat generated from sunlight,” said Fix, who compares the sunscreen and sheath to various layers of clothing that can be put on or taken off. “Sensors decide on a cold day, for instance, whether both parts should be extended in order to preserve heat inside. If more light is needed indoors, there’s then the option of retracting the opaque outer layer. 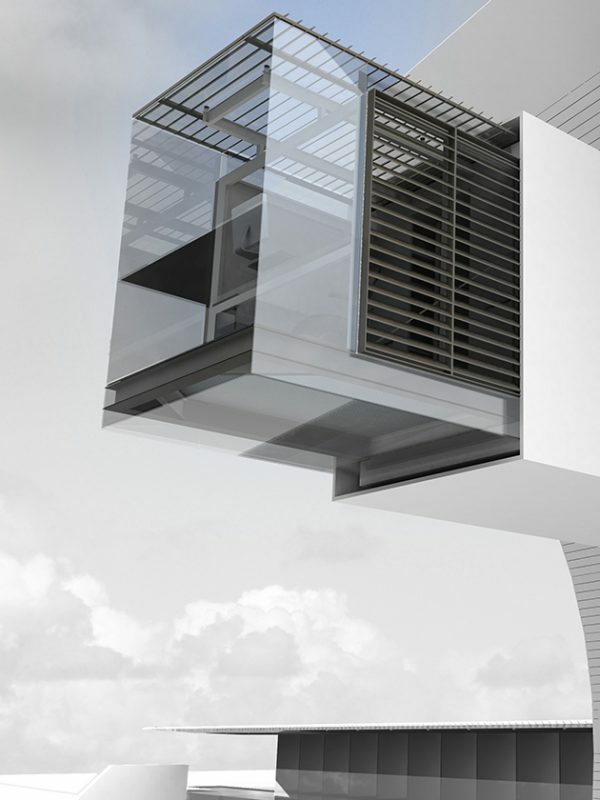 The house can be controlled both automatically and manually. Thanks to the lightweight design of these various layers – and the fact that they run horizontally on sliders – they can operate on very low energy consumption levels. It sounds more like an engine than a house, and it is in fact highly complex from a technical viewpoint. But this building does not lose sight of the fun factor. 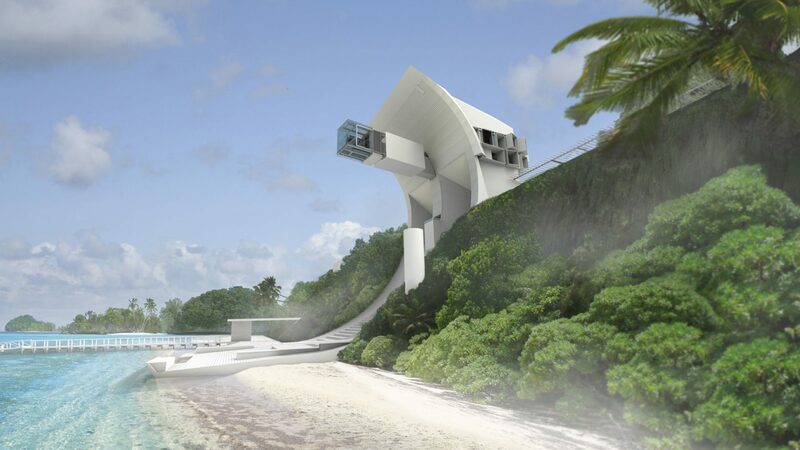 Fix has envisaged an amphitheatre at the foot of the sail-formed building where films can be watched on a screen that retracts down into the floor. This area also features an outdoor kitchen and built-in dining table. The roof provides scope for creating a garden, alongside three pools intended both for swimming and for absorbing heat. 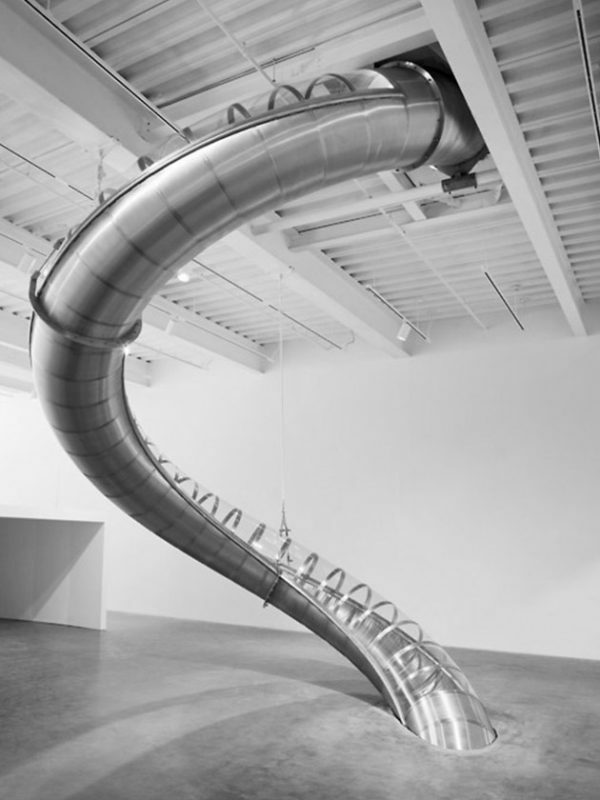 Meanwhile, inside this anything-but-normal home, a tube slide designed by the artist Carsten Höller transports you down through all levels to the beach below. Fix refers to this as “fun functionality”. 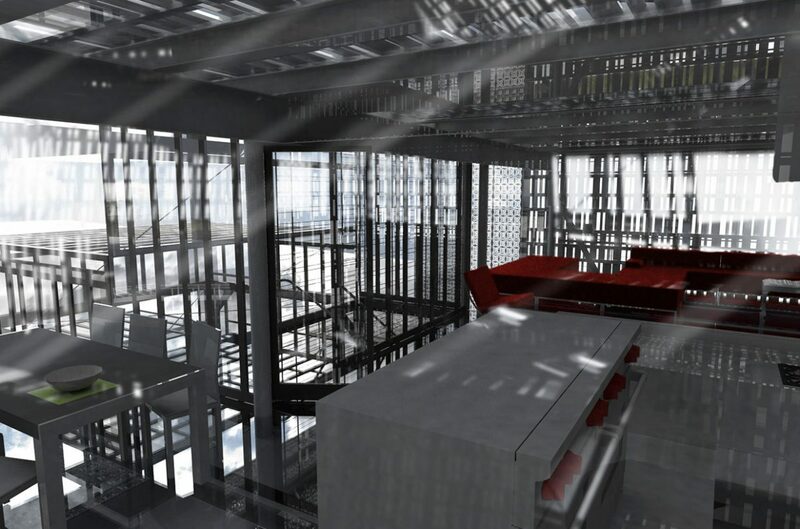 The futuristic vision of Mo Ventus remains virtual at present. So it does remain to be seen just how well all these energy-saving design features work in practice under real conditions. Yet aside from its energy-related intelligence, the thing that makes this building so interesting is the total freedom it brings regarding the size and design of the interiors. The living spaces, bedrooms, bathrooms and workspaces can be integrated into an area spanning anything from 465 to 1,115 m2. Fix is of the opinion that a home costing between 3.5 and 10 million US dollars must be able to offer this level of flexibility. 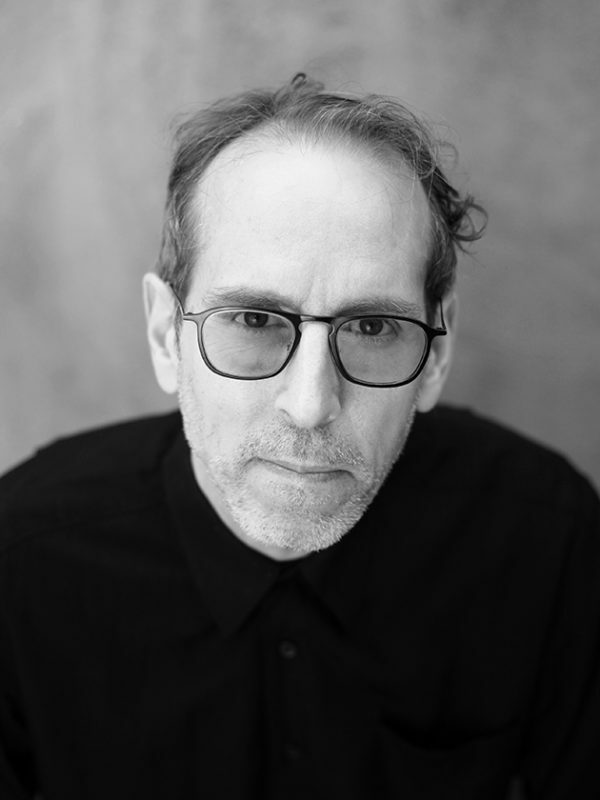 In the pursuit of architecture, Todd Fix has learned from educators at the Swiss Federal Institute of Technology, Architecture Association in London, Harvard University, and the University of Nebraska. His career has seen him realise designs for everything from infrastructure projects and private residences to apartment buildings, commercial complexes, museums and exhibition spaces. “All of this combined experience has inspired me to build Mo Ventus,” he says. “For me, it’s the culmination of various aspects that all have to work together in the architecture: design, healthy construction techniques, material research and green technologies aimed at protecting our environment.” Behind Fix’s creation is a will to bring political, social, cultural and visual considerations together in one building, harnessing high-tech to enhance quality of life. Co-existence with nature is at the centre of the Boston architect’s vision here. Achieved in the case of Mo Ventus with the location itself, as well as thanks to the material glass and the various possibilities to open up its façades. SANTA MONICA (US) ENGEL & VÖLKERS AVENUE REAL ESTATE SANTA MONICA, LIZENZPARTNER DER EV REAL ESTATE, INC.